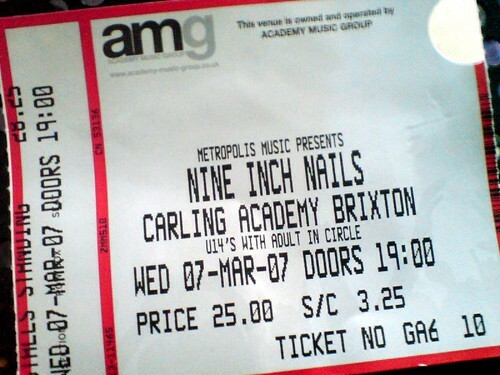 Went to see Nine Inch Nails live at Brixton Academy last night, thanks to an extra tickets procured by my good friend Willsy. NIN are a band I've been into since their first album "Pretty Hate Machine", although I did get into it a year or two after release. However, I'd never got the chance to see them live, or missed out on tickets etc, so obviously I was pretty excited about seeing them. They definitely didn't disappoint, and definitely surprised with the choice of set list. Most of the material was from "Broken" and "The Downward Spiral", with one brand new track from the forthcoming "Year Zero" album, and the singles from their last studio album "With Teeth". Highlights of the night for me were "Wish", "Gave Up", "Only", "Hurt" (which sounded astounding live), and of course their usual closing number "Head Like A Hole". 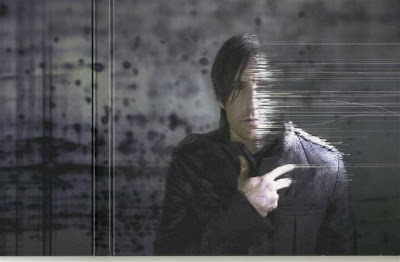 Only one criticism from me was that at times the guitarist was drowning out the electronic side of things, which is part of what I like about NIN - the fusion of live instrumentation with electronic sounds. Didn't spoil the show for me though. Trent Reznor (NIN's lead singer and main man) had to cancel a show the previous night and despite mentioning that his voice was troubling him, still sounded great. I'm really looking forward to the new album "Year Zero", released on 17th April 2007. You can see a cool "trailer", and find out some more info on yearzero.nin.com. Tracks have already been leaked, alledgedly by Reznor himself by leaving mp3's on flash drives in the bathrooms at live gigs. These tracks have naturally made their way onto the net, and across radio stations. "Year Zero" is said to be a concept album, the marketing of which so far has been some of the most inventive use of viral methods I've heard of in recent times. I think I'll do another blog focusing on that in due course. Anyway, here's the awesome video of the single "Only" from the "With Teeth" album. Clever, clever stuff!